What is a liberal arts education? It is considered education in all academic subjects, such as literature, mathematics, philosophy, and all sciences. It is very distinct and separate from professional, vocational, and technical education. In classical antiquity, a liberal arts education was considered what a person (citizen) needed to have in order to fully participate in and contribute to civic life. Often in articles like this one about education, the emphasis is mainly on what the end result should be but lacks a new or practical insight on how to get there. In this article, the desired end result is more students pursuing a liberal arts undergraduate degree regardless of their desired post-college career path. The author inserts one or two throwaway sentences regarding the means to the end. Here, the author says, “We must push ourselves as a society to make math and science education innovative and engaging, and to value teachers and education.” Sure, it sounds nice. Everyone wants to be on the side of valuing teachers and education. A high level of commitment to and value placed in something doesn’t amount to much if you are committed to and value the wrong thing, in this case our country’s current approach to education. I think the author would have been well served to offer a different insight here – that maybe our approach to pre-collegiate education should change in order to produce kids who are capable of pursuing and earning a liberal arts degree in college. And, what does that look like? A classical education! 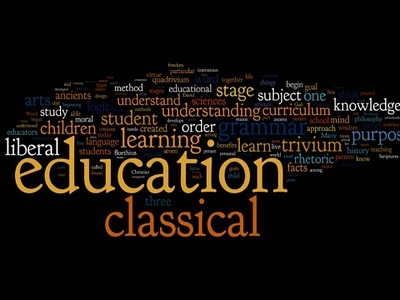 By working through all the stages of a classical education, from grammar to logic to rhetoric, students are not merely filled with information, but taught how to think, read, and write - all from a critical and analytical perspective. Students are not only expected to regurgitate information, but to take in information, analyze it, and critique it. When coupled with a Christian worldview, students are encouraged to seek truth, beauty, and virtue; and to realize that these values are not subjective but can be known. The author includes at the end of his article that studying Judaism has added to the fullness of his life. If we don’t understand our proper position in the world, why value education? Why understand the world? Being able to integrate a Christian worldview with education, like our students receive at ACA, is another key element to a fully rounded liberal arts education. What do you think? Do you agree or disagree? Leave a comment below!